For years, E. Forbes Smiley III seemed to be the kind of man who matched his name’s connotations: moneyed, educated, successful. An antiquarian map dealer, Smiley shuttled between both sides of the Atlantic, becoming an expert in valuable and rare maps, particularly early maps of New England. He was also stealing them. In The Map Thief*, Michael Blanding investigates the paradox that Smiley represents. How could a man who treasured maps, who taught himself about them by poring over them in some of the world’s finest libraries, desecrate the very documents he valued and betray the people who shared his interests? Mr. Blanding delves into Smiley’s life and work, bringing to life Smiley’s quixotic attempt to shape the world to fit his vision. (For instance, Smiley tried to reinvigorate a Maine town on his own, without much consideration of residents’ input, which turned into a spectacular failure.) His friends came up with the term “Forbes dollars”: “a personal accounting system in which Smiley always spent less than he had and was always owed more than he was” (83). As his career progressed, Smiley sank deeper into debt, impulsively buying maps even if he didn’t have the funds ready to pay for them. In one instance, Smiley bought a rare atlas from another dealer for $50,000. When his check bounced, the other dealer demanded the atlas back, but it was too late: “he had taken the atlas apart right on the train up to Boston, selling several charts of Boston Harbor to Leventhal and keeping the rest, hoping to sell them to other clients to recoup the cost. [. . . ] he [the other dealer] couldn’t help but be appalled that Smiley had so cavalierly taken apart a book with less than ten known copies in the world” (73). If the thought of Smiley tearing apart an atlas he (ostensibly) bought makes you shudder, the actual thefts will repel you. The gravity of the thefts — the number, the institutions affected, the rarity of the works taken, the fact that many are still unrecovered — is simply outrageous; Smiley’s prison sentence seems ridiculously light. I’ve had the privilege of handling two or three rare books, and the thought of someone opening one too swiftly sets my heart racing — the thought of someone ripping out a page is painful. Though Smiley is the subject of The Map Thief, and Mr. Blanding places him in the context of the lively and sometimes strange world of rare map aficionados (dealers, collectors, and librarians), the book shines brightest when Mr. Blanding recounts the history of the rare maps themselves and the people who created them. The research is meticulous, and the historical characters fascinating. The book includes several full-color plates of some of the maps discussed in the text, and they’re just glorious (this comes, by the way, from a person whose only displayed map is one of Middle Earth). 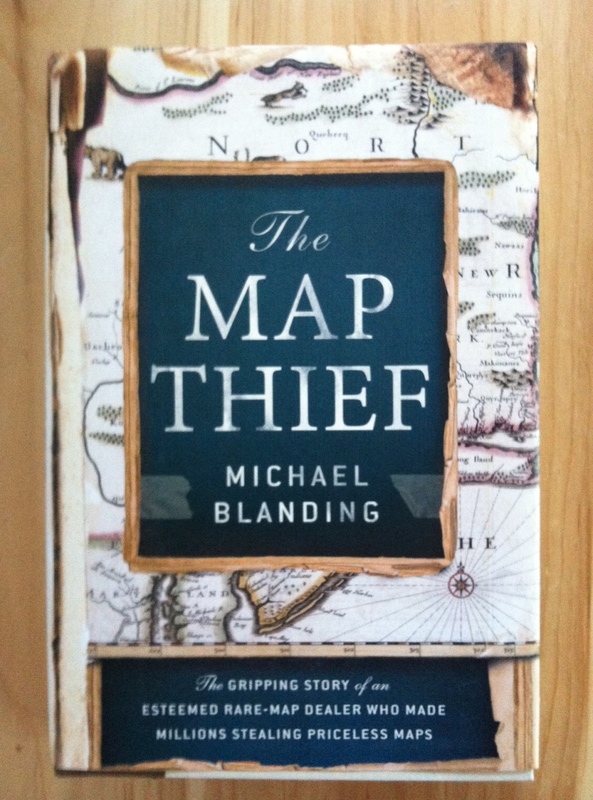 If you aren’t a map person before you read this book, you very well may be one afterward. *I received a review copy of this book from the publisher in exchange for an honest review. I read a magazine article about this guy. It’s pretty shocking. This does sound interesting. Especially the history of the maps and who created them. This reminds me of The Bookman’s Tale, which deals with rare books and manuscripts. Except, of course, that was fiction. Is this a true story?! I think I’d love it if it were fiction but the idea that someone would desecrate such work in real life is appalling. I’m not sure I’d like it if it were true, but I’m definitely intrigued. I love maps. Yes, it’s a true story. And if you love maps, you’ll like the book and absolutely loathe Smiley. That’s what I’m wondering too, is this fiction or non? I’ve heard of the book and thought it was fiction..